NASA’s plan to make a little space history with the first all-woman spacewalk has hit a snag: The right size spacesuit isn’t ready. Astronauts Anne McClain and Christina Koch were expected to continue the installation of new lithium-ion batteries for the International Space Station’s solar energy system on March 29. Work on the project began on March 22 when McClain and another astronaut, Nick Hague, spent almost seven hours working in free fall outside the station. 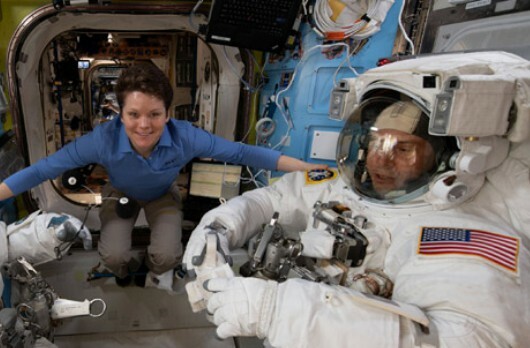 The mission had originally planned for Koch, a former US Army aviator, to wear a large-size torso for her spacewalk with McClain, an aerospace engineer. The ISS only has one medium-sized hard upper spacesuit torso prepared for extra-vehicular activity (EVA), with the other acting as a spare. A NASA spokesperson told Quartz the station has two large torsos and one extra-large torso ready, plus a spare extra-large torso. Neither of the spares can be configured in time for the EVA planned for four days from now. Working in a spacesuit is one of the most physically demanding of an astronaut’s duties. Though they are in free-fall, moving their arms and hands inside the suit requires them to push against the pressurized internal atmosphere that keeps them alive and the protective gauntlet of the suit itself. A poorly-fitting suit would seem likely to add unnecessary difficulty to a risky activity. Already, astronauts working multi-hour shifts lose track of tools that drop off into space. The lack of spacesuit sizing options reflects the composition of NASA’s astronauts: The most recent class consisted of seven men and five women, but only 12 of the 38 currently active astronauts are women. Female astronauts have still been major participants in EVAs: Susan Helms shares the record for longest duration, spending nearly nine hours outside the airlock; Peggy Whitson has made 10 trips, for a cumulative 60-plus hours in free-fall. An all-women spacewalk will have to wait, but McClain is scheduled to head out the airlock again on April 8 alongside Canadian astronaut David Saint-Jacques.